Memorial Day Coming...Introducing The Sister of Ice Box Cake! In spite of the blustery, 50 degrees outside, the calendar claims that it is only two weeks till the unofficial start of summer, Memorial Day weekend! And the faithful readers of Kitchen Clatter (and the 1,500 who have downloaded the recipe) know that I always kick off the "hello-summer" season with an Ice Box Cake. A simple no-bake recipe that only requires cooked pudding and Graham crackers. A family favorite! A recipe that I can't wait to introduce to my one-year-old Grandson, Lucas. Her recipe, which she calls an "Éclair Cake" is so creamy that after one delicious bite, I stopped eating it because I was afraid it had eggs (hello, my name is Jo Ann and I'm allergic to egg yolks), so imagine my surprise when she said "no eggs, it's instant yellow pudding" No eggs, instant pudding...I'm in! So, I am now including this recipe to my summer array of no bake desserts. Trust me when I tell you it's a must try recipe! 6. Whisk together the cocoa powder, powdered sugar, melted butter and 3 Tbsp whole milk to make the chocolate frosting. 7. 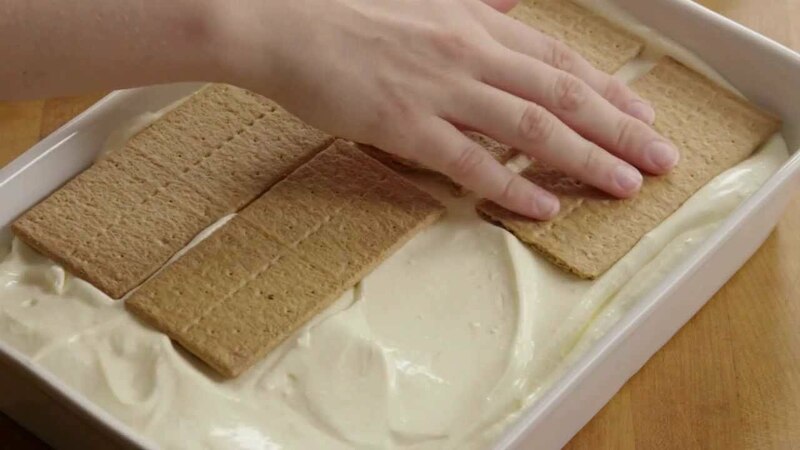 Spread evenly over top the third layer of graham crackers. 8. Refrigerate overnight so the pudding has time to set up and the graham crackers soften before serving. So, if you are into simple desserts that will not heat up the kitchen during those long summer days, this is deliciously perfect! Bring on summer! She tried to act surprised! Parties: I'm going to start this update with the one wedding celebration that all mothers of the groom dread. The event that causes you to inhale, hold your breath and whisper that grooms mother's silent prayer "please don't let them do anything stupid." The one occasion where mothers are allowed no questions. No prying, no suggestions, no information...and certainly no details. Of course, I'm referring to the the dreaded bachelor party. It happened and I survived. As did all who attended, apparently. I haven't actually seen all of the 18 men who chipped in and rented a mansion outside of Philadelphia with an indoor pool, spa and tiki bar. And I wasn't allowed to ask any questions. But those related to me, two sons and a nephew, resurfaced apparently unscathed. That's all I can tell you for now. You know everything I know. Showers: And while the boys were away doing whatever it is they do, the girls got together and held a beautiful shower for the bride to be! Now, my almost daughter in-law, Melissa, is a nature lover. 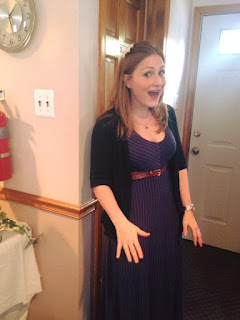 From the bridal shower, to the bachelorette party (which centers around a hike in the mountains) to the beach wedding, surrounded by the ocean and grassy marshes, she thrives in nature. Mason jars (a favorite of Melissa's) filled with baby's breath, adorned the tables, thanks to my sister Betty. Surrounding them were home made soaps scented with mint, lavender and pomegranate as favor's made by the bridesmaids. All natural, all nature, all Melissa. And, now I don't know what the boys were eating, but we were doing all right, as you can see! 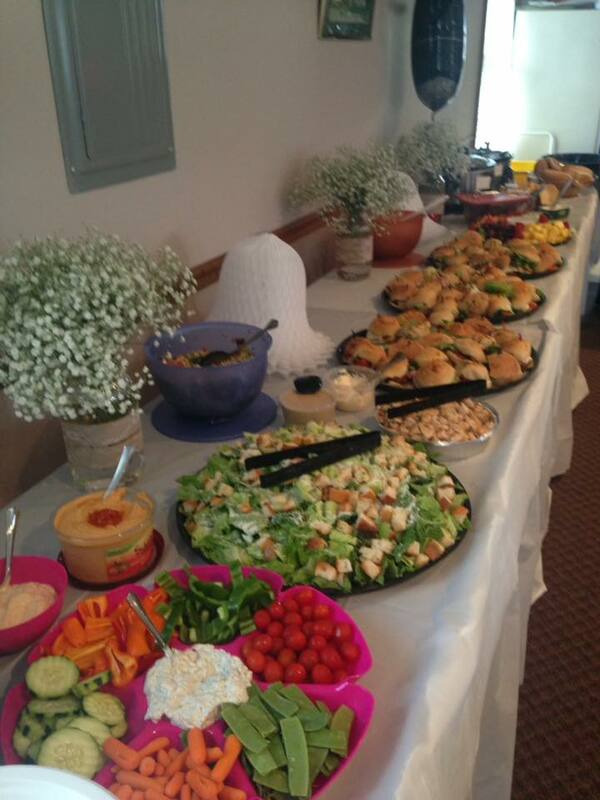 From the brides' mother, Marie's keilbasa and sauerkraut, to Betty's meatballs, and trays of Italian sandwiches, it was all there. I'm sure we ate better than the men in their mansion! Planning: With the wedding still a few months ahead of us, most of the plans are set. The venue, the music, the menu all handled by the bride and groom. There is still of course my responsibility of planning the rehearsal dinner...from 554 miles away. Thank heaven for the internet! The bride and groom want a relaxed event. Nothing formal. They actually asked if I could do a pizza party! And they want it held at the site where we will actually be rehearsing, the Wales Head State Park. So, as co-host with the Groom's father, I had to do some research in finding a caterer who would work with us to create this special event in, of course, a natural setting. And I did. He is even bringing his brick ovens and bartender with him! Score!!! My son Kyle, the groom, loves a good party. Well son, I think we will have one! And, I was smart enough to ask my niece, Beth (who truly should become a professional event planner) to decorate our tables using the abundance of cranberries and persimmons that grow wild on the island in October. Family and friends, celebrating by the ocean in autumn. I don't know how to improve on that! Bring on the Outer Banks!